This grain-free, nut-free granola is crunchy, satisfying and subtly sweet thanks to maple syrup, which also makes it vegan-friendly. You’ll love these vanilla and cinnamon-spiced, protein-rich clusters made with hemp hearts, coconut flakes, seeds, dried mango, and banana chips. 1. Preheat oven to 325°F and position a rack in the center of the oven. 3. Add all remaining ingredients and stir until the mixture is evenly coated. Spread an even layer of the mixture onto a large parchment-lined baking sheet. Bake for 25 minutes until granola is golden brown in color. The coconut oil will help the granola crisp up nicely, but watch it carefully as it browns quickly. 4. Remove from oven and let cool completely. It will get crunchier as it cools. 5. Break into clusters of varying sizes and then mix in dried diced mango and banana chips. 6. 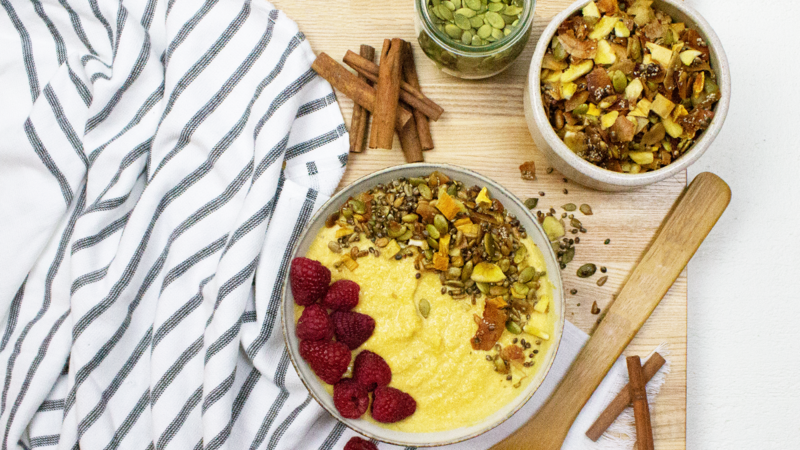 Enjoy a bowl on a weekend breakfast or top your favorite alternative yogurt or smoothie bowl. Store leftovers in an air-tight container.